Do you know young scientists with a real passion for harnessing the tools of molecular and genetic biology for improving human health? 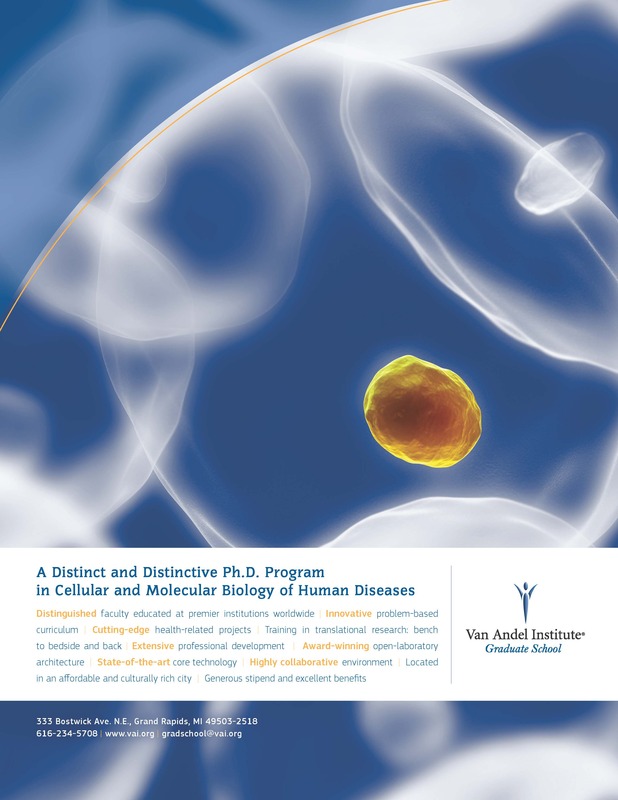 The doctoral program of Van Andel Institute Graduate School provides an innovative developmental path for students with the capacity and motivation for careers in biomedical research. I would be grateful if you would bring this opportunity to the attention of outstanding students in your program. 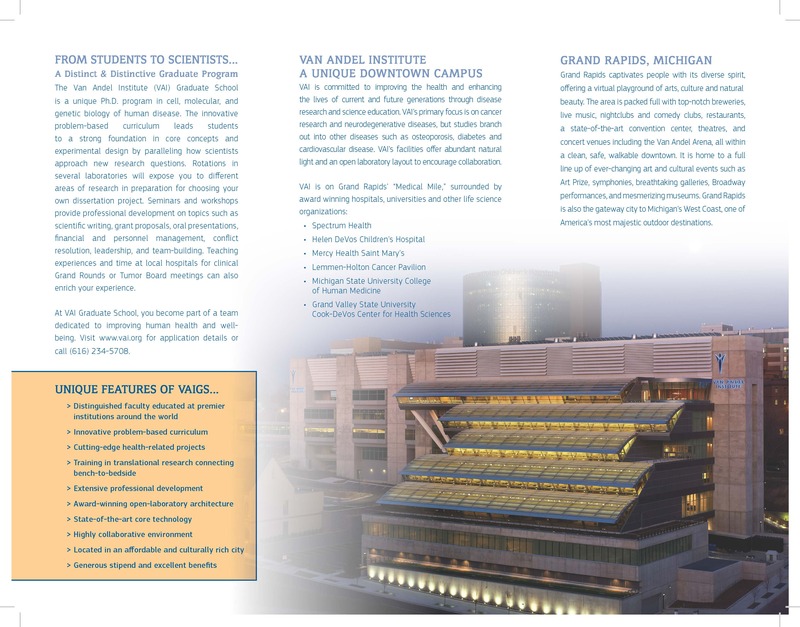 Van Andel Research Institute, located in Grand Rapids, Michigan, conducts biomedical research with an emphasis on translating scientific results into clinical applications. Van Andel Institute Graduate School trains Ph.D. scientists to be research leaders in cellular, molecular and genetic studies relevant to human diseases. This unique doctoral program prepares researchers for effective careers linking the discoveries of basic science with the applications needed for improved human health. Our innovative curriculum leads students to explore fundamental concepts in genetics, biochemistry, cell and molecular biology through highly integrated, problem-based courses based on current research questions, in preparation for their dissertation research as they take on their professional status as scientists. For the entering class of Fall 2016, we seek effective independent learners who work capably in a collaborative team environment. A solid foundation in cell biology, molecular biology and genetics will be important, but more essential is an understanding of and passion for the life of a scientist and the exploration of cutting-edge scientific questions. Those with a bold and pioneering spirit will make the most of this opportunity. More information is available at our website (www.vai.org) or by contacting the graduate school office at gradschool@vai.org or (616) 234-5708. Thank you in advance for connecting your outstanding students with this outstanding opportunity. Send cover letter, vita, copies of undergraduate and graduate transcripts, statement of teaching philosophy, three original letters of recommendation, and description of proposed research to: Dr. Robert E. Sammelson, Chairperson at chemoffice2@bsu.edu. Review of applications will begin immediately and will continue until the position is filled. This is a call for poster presentations. The poster session is open to students and post-doctoral researchers and covers research in all areas of polymer science and engineering. There is no registration fee for any faculty or students with university affiliation. For those students whose research is closely aligned with the theme of the symposium “Polymers and Their Biomedical Applications”, we will elevate two of the poster submissions to invited talks. Thank you for your time. If you have any questions, please call or email me. 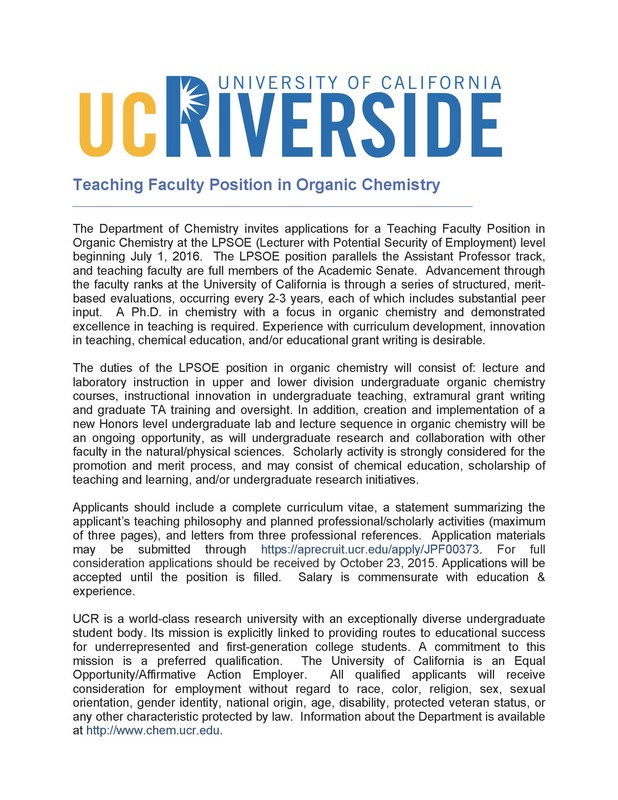 The Department of Chemistry at the University of California, Riverside seeks outstanding applicants for four new faculty positions in 2016. Attached are ads for the first two positions scheduled to appear in the Oct 5 issue of C&E News. The list below also includes direct links to the specific iRecruit application portals. We would appreciate your help in distributing this information to potential applicants. Advertisements for the ETOX and Atmospheric chemistry positions will appear soon. 3) Assistant Professor in Environmental Toxicology. 4) Assistant Professor in Atmospheric Chemistry. The four new chemistry hires will augment the recent and continuing growth in the size and reputation of the UCR Chemistry program. New faculty will be able to contribute to and benefit from the enhance visibility and reputation of the program. UCR Chemistry is ranked 25th in US in the 2015 Annual Review of World Universities and is ranked 26th in the US in the current Nature Index (http://chem.ucr.edu/). candidates will be considered. This position will start in Fall 2016 at our Blacksburg, VA campus. continue until the position is filled. Occasional travel to attend professional conferences may be required. about the position should be directed to chem.jobs@vt.edu, with the job posting # included in the subject. opportunities to women and minorities in science and engineering. with a dedication to interdisciplinary education. academic departments campus-wide to develop and support new directions in scientific research and education. encouraged. The tenure line for this appointment will be located in the Department of Chemistry. http://www.provost.vt.edu) provides a complete description of faculty responsibilities at Virginia Tech. or in a previous faculty appointment. science education. Applicants should arrange for at least three letters of recommendations to be submitted online. any other basis protected by law. 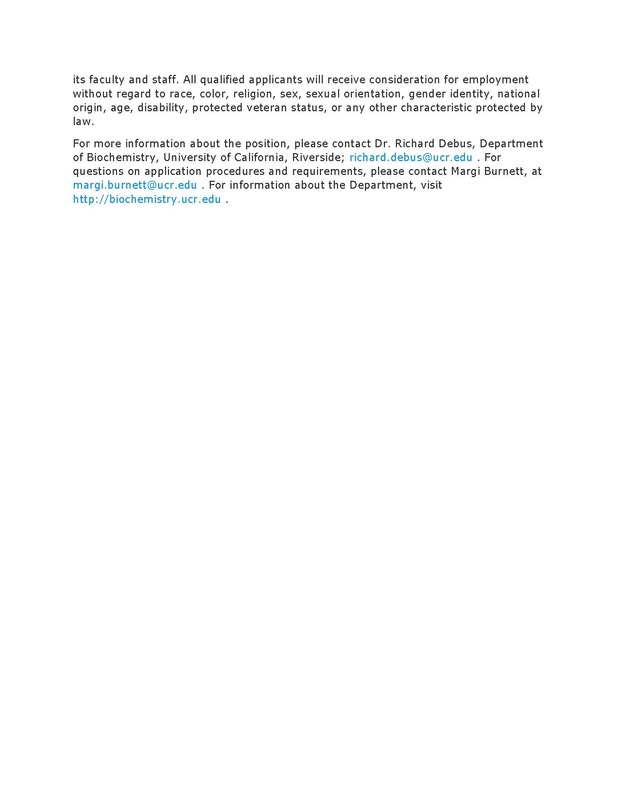 The Department of Biochemistry at the University of California, Riverside invites applications for a new tenure-track faculty position at the Assistant Professor level in any area of epigenetics but with an emphasis in understanding epigenetic mechanisms in vivo and their roles in human diseases. Areas of particular interest include (but are not limited to) epigenetic modifications in cancer, the intersection of metabolism and epigenetics, epigenetic mechanisms in stem cell biology, mammalian development, and/or aging. The position will build on existing campus strengths in genomics and epigenetics in different model organisms, including faculty with expertise in structural, molecular, and cellular biology who study epigenetic coregulators and modifications of chromatin structure, non-coding RNAs, transcription regulation, or DNA repair in the context of metabolism, stem cell biology, cancer, neuroscience and aging. 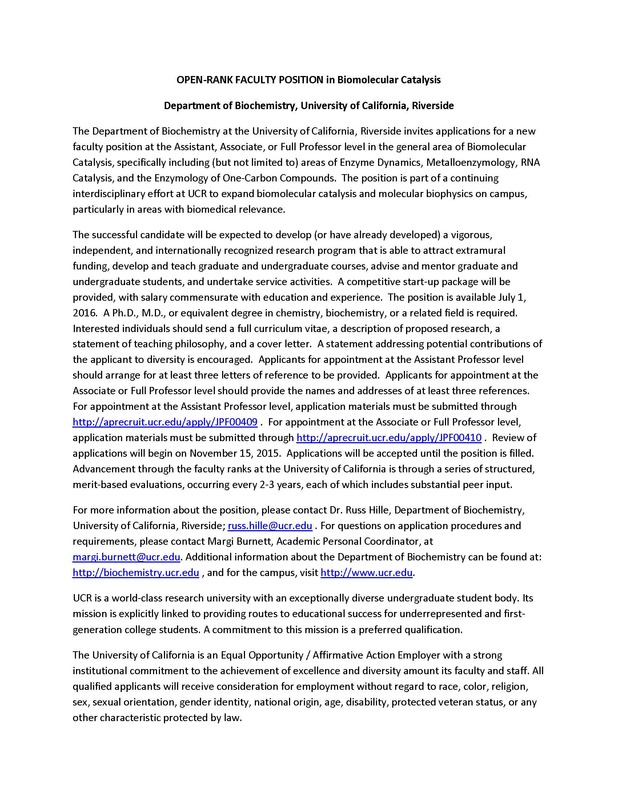 The Department of Biochemistry at the University of California, Riverside invites applications for a new faculty position at the Assistant, Associate, or Full Professor level in the general area of Biomolecular Catalysis, specifically including (but not limited to) areas of Enzyme Dynamics, Metalloenzymology, RNA Catalysis, and the Enzymology of One-Carbon Compounds. 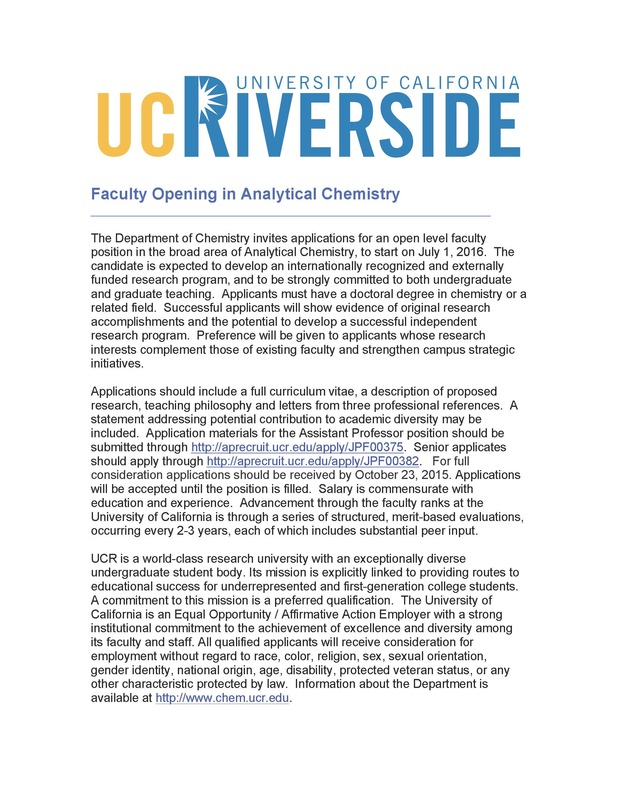 The position is part of a continuing interdisciplinary effort at UCR to expand biomolecular catalysis and molecular biophysics on campus, particularly in areas with biomedical relevance. 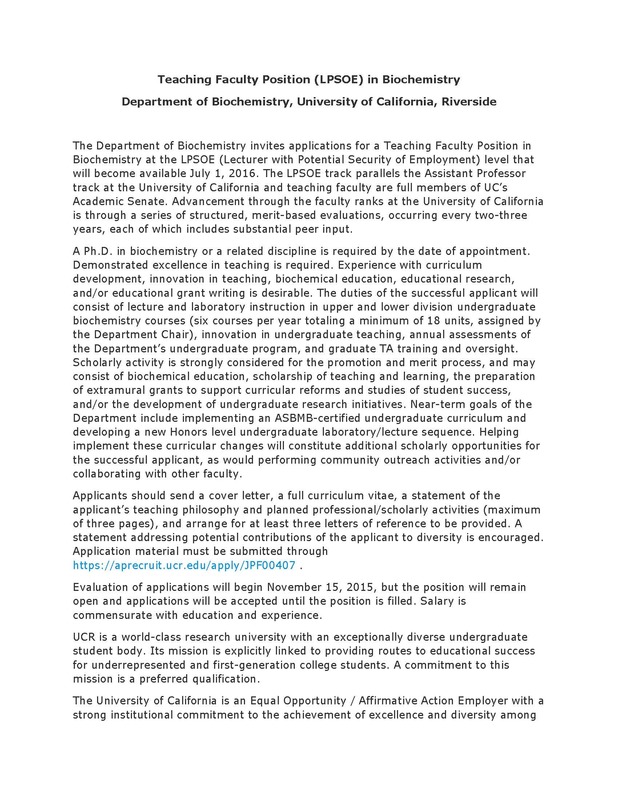 The Department of Biochemistry invites applications for a Teaching Faculty Position in Biochemistry at the LPSOE (Lecturer with Potential Security of Employment) level that will become available July 1, 2016. The LPSOE track parallels the Assistant Professor track at the University of California and teaching faculty are full members of UC’s Academic Senate. Advancement through the faculty ranks at the University of California is through a series of structured, merit-based evaluations, occurring every two-three years, each of which includes substantial peer input. The Department of Chemistry (www.ksu.edu/chem) invites applications for a tenure-track position in Synthetic Inorganic Chemistry at the rank of Assistant Professor to begin in August 2016. A Ph.D. in chemistry is required and postdoctoral experience is desirable. The successful candidate will be expected to establish a creative and vibrant research program that attracts extramural funding and capable co-workers; s/he will also be expected to excel in teaching to a diverse population at the graduate and undergraduate levels. Candidates should submit a letter of interest, a curriculum vitae, descriptions of proposed research, and a statement of teaching philosophy and interests. Also arrange for at least three letters of recommendation to be sent to: Professor Christer Aakeröy (aakeroy@ksu.edu), Department of Chemistry, 213 CBC Building, 1212 Mid-Campus Dr North, Kansas State University, Manhattan KS 66506. 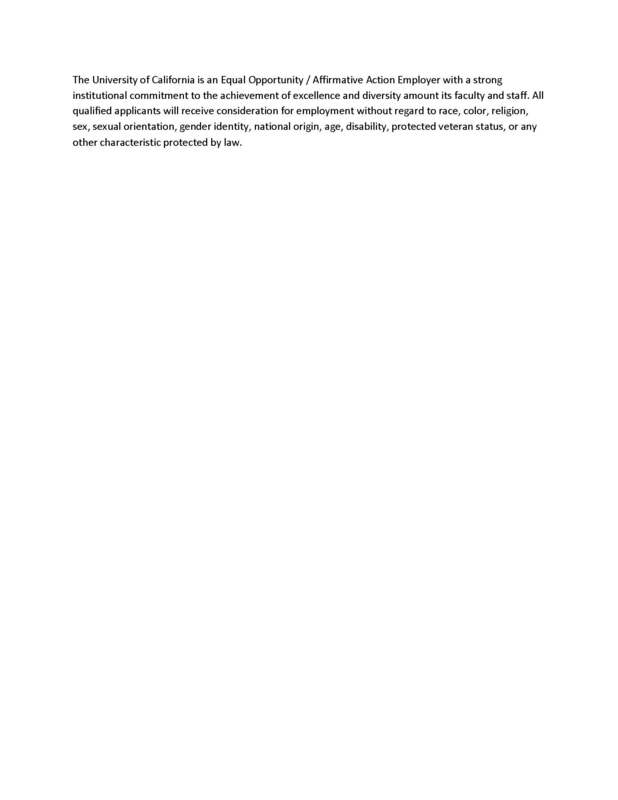 Screening of applications will begin on 10/31/2015 and will continue until the position is filled. The Department of Chemistry (www.ksu.edu/chem) invites applications for a position at the rank of Instructor to begin in August 2016. An M.S. in chemistry or chemical education is required; a Ph.D. degree is desirable. This is a regular position with opportunities for promotion in rank. The successful candidate will be expected to excel in teaching to a diverse population in our first-year courses. Candidates should submit a letter of interest, a curriculum vitae, and a statement of teaching philosophy and interests. Also arrange for at least three letters of recommendation to be sent to: Dr. Yasmin Patell (yasmin@ksu.edu), Department of Chemistry, 213 CBC Building, 1212 Mid-Campus Dr North, Kansas State University, Manhattan KS 66506. Screening of applications will begin on 10/31/2015 and will continue until the position is filled.